In the end, we got the the Miku videos up. You can see them here. But the road there was long and circuitous. 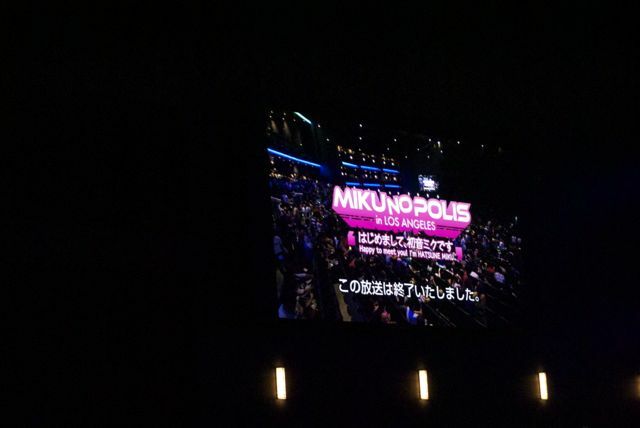 She told us, the nice girl at the press booth, that we needed to a sign a form to film the Hatsune Miku concert. 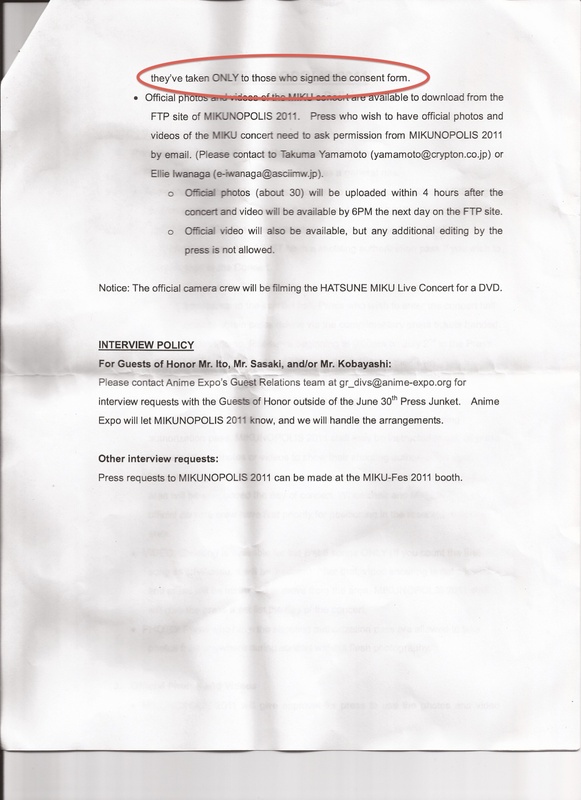 It was a three page list of rules with a consent form at the end, which needed to be signed to get both photo and video shooting rights. Each press outlet only got two main event tickets for the whole con, and since I wanted to go to Kalafina, that meant only one person would get to cover Miku. A three page list of rules sounds restrictive and intimidating, but as we read them we were astonished by their generosity. We were allowed to shoot six songs, seven if the intro montage was included. We were allowed photography rights anytime. These are some of the loosest rules I’ve ever seen in my time as press at anime conventions, in which the norm has usually been 3 songs maximum, if any at all. (The no-footage-whatsoever rule for Miyuki Sawashiro was more extreme than most, but the norm is closer to that end than to its opposite.) Moreover, no restrictions were described in public dissemination for the footage and photography—no prior approval or limit written in the rules. We were, in other words, free as can be. And I knew we had to get that footage out ASAP. 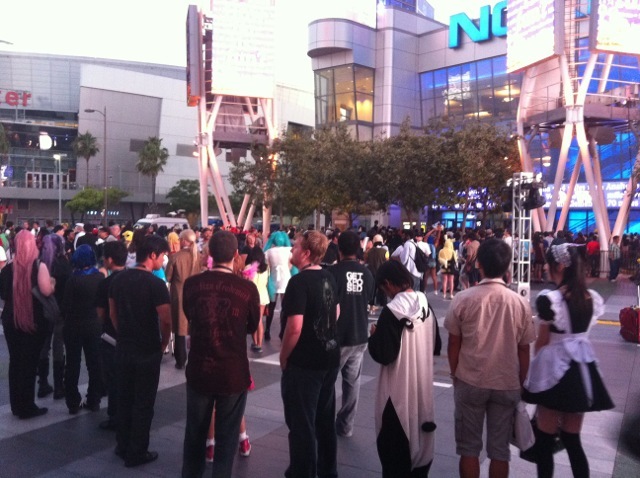 These people were in line for the Miku concert. A local news crew apparently interviewed some of them for the evening broadcast. I remember sitting outside the Nokia Theater the night of the concert, writing my Kalafina reflection article. It was a warm evening, t-shirt and shorts temperature, and I was in as relaxed a mood as I possibly could be in the middle of a hectic convention. When the Anime Diet staff who attended came out of the show—Rome, Dan, and Mike—they were excited, albeit tired. I looked at the footage Dan shot—despite his initial misgivings, it was more than usable. It had gotten the essence of what the concert was like; the music was crystal clear and the smoothness and dynamism of the animated idol was plain. In short, I knew we had a winner. We celebrated at the ESPN Sports Zone. It was also Dan’s birthday, and we had a toast. Then we all drove home. I spent some time in the press lounge over the next couple of days, splitting the footage into songs, adding a few titles. I doubled checked the rules to make sure we weren’t restricted on it. We weren’t; the only thing even close was a set of contact info if we wanted access to the official photos and videos that would be made available to the press. So we uploaded them—where else?—on Youtube, the first ones going up on the last day of the convention. They were an immediate hit, with thousands of views. I noted specifically that we had permission, and that an official DVD/Blu-Ray was forthcoming (its release is now imminent as of this writing). The videos, while clear, were no substitute for whatever official footage would come along: the angle wasn’t ideal, for one. It was a nice preview at best. This is just one strike of two. The takedown notices came within almost exactly 24 hours, one right after another. They came from a party I didn’t know was involved with Miku, Sega Japan. (They are the ones who actually animated Miku’s motions.) While it ruined my dinner and made my blood pressure rise—not since we were kicked out of Google Adsense for “adult content” have I been so irritated and angry on behalf of the staff—I also was somewhat prepared for it. 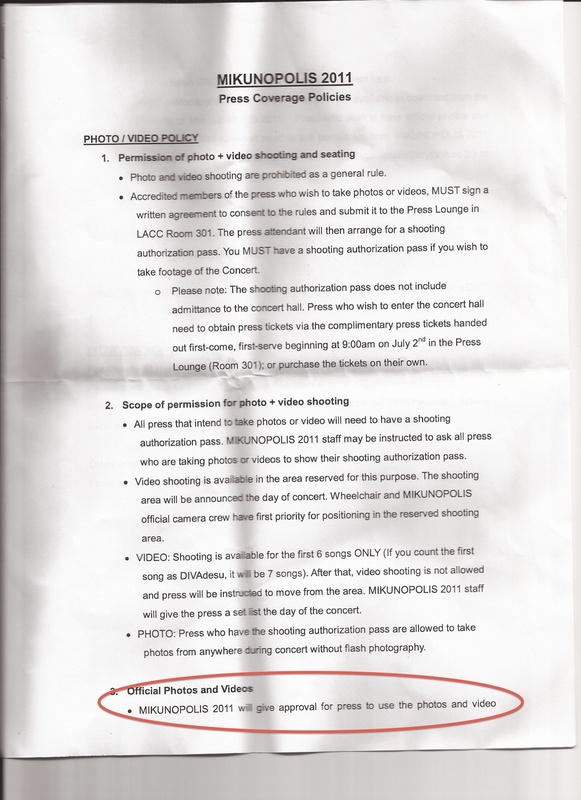 Posting concerts, though we’ve done it before without issue when it was part of our press privileges, can be risky. But the document, I assumed, had us covered. I immediately called Dan and asked for a scan of the rule sheet, knowing that there was no provision on there for video releases on the Internet. It’d be a matter, I was sure, of contacting the right people listed on the sheet and explaining the situation, pointing out that our contract didn’t specify anything of the sort, and that we should get at least our Youtube demerits removed. So I wrote emails to both reps that were listed in the contract—one from ASCII Media Works (sponsor of many of your favorite current anime) and one from Crypton Future Media, the creators of the Hatsune Miku character and voice. I wrote a long, detailed and documented email, complete with annotated scans of the rules. We were in the right, I felt, and we could prove it. This was a misunderstanding that could be cleared up if I just simply explained it in justifiable detail. That, in retrospect, may have been the wrong approach. Neither representative was a native English speaker, and the wall of English text may have been intimidating. They may not have had the authority or even the knowledge to correct an issue with Sega and Youtube. I only received a brief reply from the ASCII representative, which indicated (as far as I could determine) that Sega was busy removing videos from Youtube and that this was their initiative to prevent piracy. In short, my question wasn’t answered, and I replied back that the issue was that we thought we did have permission. You can see the rules we got for yourself below, with the relevant section circled. We’ve never received any further replies from any party. Not ASCII, Crypton, or—once I discovered how to contact them on Youtube—Sega. I sought help from a friend who speaks fluent Japanese and has worked with industry figures before to draft a much shorter, to-the-point letter. It got no response either. 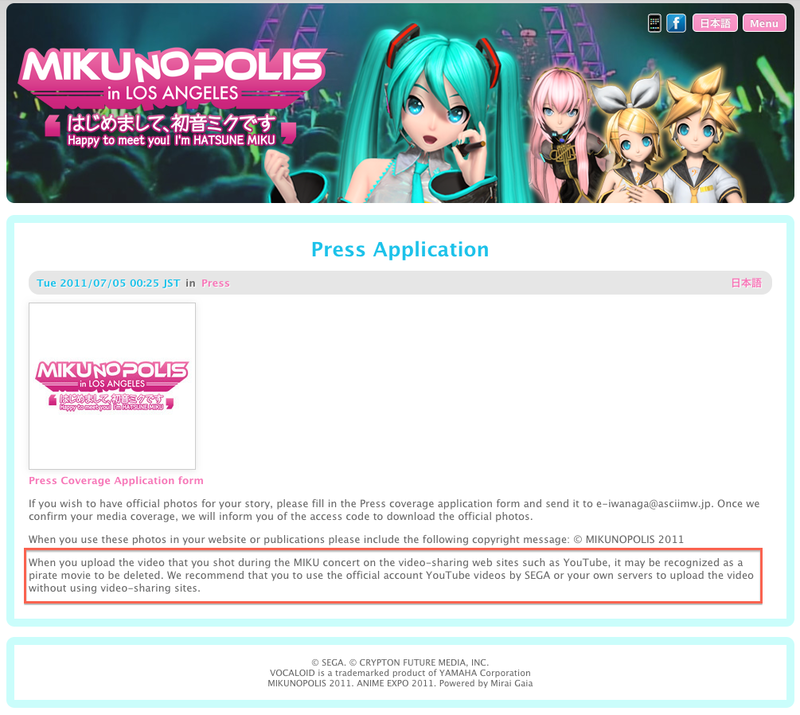 She explained that Miku’s rights are knotty and complex, with many stakeholders on the production committee; it was very possible that the left hand did not know what the right hand was doing, and that just because Crypton and ASCII permitted something does not mean that Sega or anyone else would. And a glance at Youtube revealed that Sega had been pretty ruthless indeed; no video with any clear close-ups of Miku or other Vocaloids remained from that concert, by anyone. They were consistent, at least. So we had no videos, two strikes on our Youtube account, and no recourse. Youtube’s counterclaim procedure—in which you say that you indeed own all the rights to the creation—had the scary warning that it could lead directly to a lawsuit. In fact, a lawsuit was required if the content owner disputed your counterclaim. I hesitated greatly at this prospect. I began to despair that we’d ever get the strikes removed, which by now was the main goal—having strikes forbids us from posting videos longer than 15 minutes and any additional strike for any reason will get all our videos removed. So that was it. 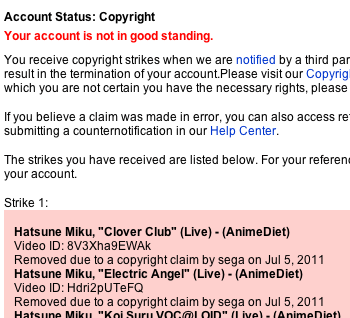 Sega didn’t want any Miku vids on video sharing sites, but they had no problem with self-hosted videos. Why they didn’t tell all of us as press this earlier, I have no idea. They could have told us this when I made my email inquiries too. Thing is, we at Anime Diet have no desire to go against the wishes of the rights holders. We just needed to know the rules up-front. Those two sentences would have avoided all of this trouble had they been in the rules from the beginning. But I was happy to discover this. It led me to repost the videos on our own servers the very next day. The black marks on our Youtube account still remain, however. I’m still considering what to do with that. So the story is, in a way, not quite over. But the important battle—the videos themselves—is concluded, in a kind of victory. I tell this story not for pity’s sake, or to showcase our spoiled nature, or even to disparage Sega or other rights holders. I certainly could have googled for the official site much earlier, so it is a story of my own neglect as much as anything else. What we have here, though, is a great example of both the liminal nature of being fan press I talked about earlier, as well as the importance of communication. This was a problem with two dimensions. One is that Sega’s discomfort with press footage loose on Youtube and other video sites is an example of how much further “new media” has to go in terms of respectability, especially when they are still not far removed from their fan roots. A CBS, NHK, or CNN would probably have no problems posting similar footage, and the ASCII rep’s cloudy reply mentioned something about how Sega wanted to prevent “audience footage” or something like that from getting out. Clearly, Sega had the mindset that whatever was shot by parties other than themselves was amateurish and unworthy of release. 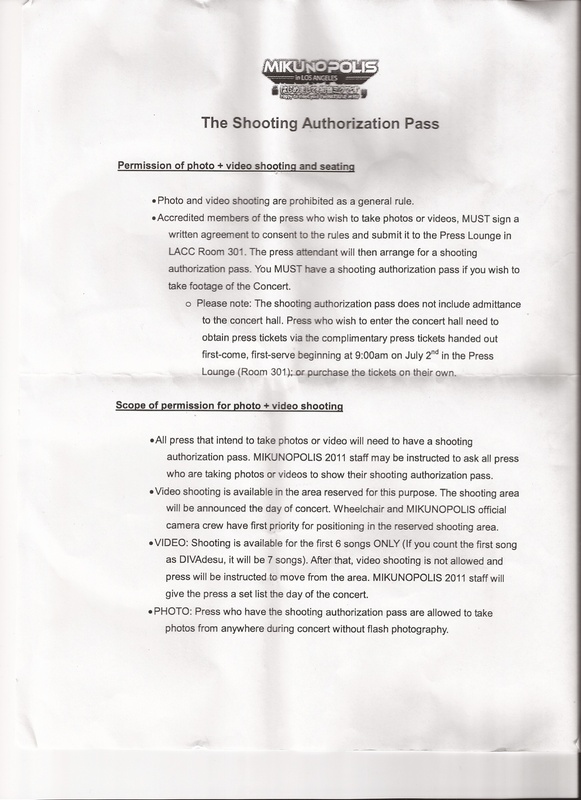 While I understand that mentality to some extent—it’s the same mentality that prevents many guests of honor from being filmed or photographed in general by their management—it needs to be clear what is and isn’t allowed from the get go, so that the outlets who follow the rules to the letter don’t get penalized. That’s the second aspect, and the more important one. What burned about the experience was how after-the-fact it was: how we found out two months afterwards that the problem wasn’t having videos, the problem was putting it on Youtube. This is not clear from simple takedown notices that offered no precise explanation for their removal. I realize here, too, that language and culture barriers may have played a role. Yet the rule sheet, and the explanation on the website discovered later on, were clear enough. Had those two sentences been in the rule sheet, we’d not be in this mess. The videos would have been posted not long after the concert and all parties would be happy. It was not a loss. I learned a lesson about communication and about the need, as a reporting outlet, to ask the right questions beforehand; and that in our mission to bring you the best and most complete coverage there are always going to be lumps along the way. They’re worth taking, though. Despite my frustration—on behalf of Dan, who shot the videos, and for my staff and for our viewers—I think we did right, and we always want to do right by both you, our audience, and to rights holders. We may be scrappy and “new” as media, but we’re also growing. Let us know, that’s all we ask. Chances are, we probably want to do the same thing. Whew. Glad that’s off my chest now. :) The next part will be the final part in the Conventional Wisdom series, and it’ll be a lot more positive. Next time: hobnobbing with CEOs and bloggers.